Pleasing a tween or teenager can be difficult at times and finding products that are good for their skin while still being considered "cool" is also hard. 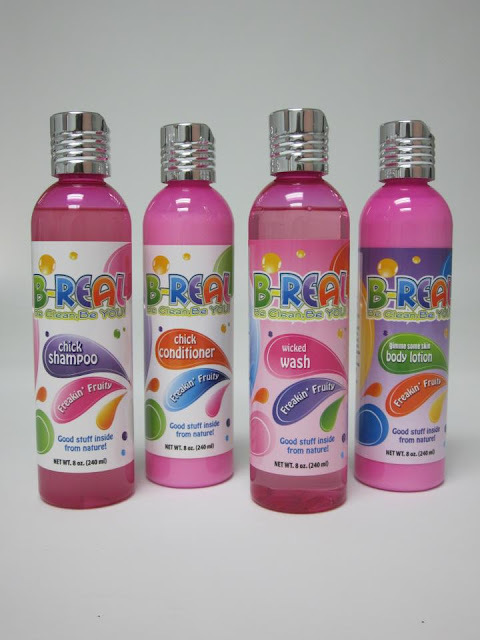 We tried a fun and fruity body wash and lotion from a lovely little company called B-Real that is based out of Auburn Hills, Michigan (my home state). B-Real was started by Kristin Berry, a mom of two who believes in using high quality ingredients to create products that are better for your skin. The lotion has kind of a long but very creative name and is called Freakin' Fruity Gimme Some Skin Body Lotion, the body wash is named Freakin' Fruity Wicked Wash. Both the lotion and wash are 100% vegan and cruelty free, both are free of parabens, sulfates, phthalates, mineral oils, silicone, synthetic fragrances, dyes or GMO’s and packed with natural botanticals! The packaging is fun and young, definitely eye catching and my daughter (who is almost 9) loved the bright pink bottles with chrome colored lids. The lotion was not greasy, it soaks into the skin very nicely and leaves only soft supple feeling skin with no oily or sticky feeling. The scent lingered from the lotion for a good couple of hours before we stopped noticing it. My daughter said she wished that B-Real made a body spray in the fruity scent and I agree, I would actually wear the body spray too because I love bright fruity smells. The body wash lathers up well and rinses clean, it leaves behind no noticeable residue. We both noticed that our skin got a little extra kick of moisture from the wash plus a hint of the fresh fruity scent remained on our skin. The fruity essential oils of lemon, lime, orange, grapefruit and sassafras smell so delicious and we really loved our experiences with the two products we tested. The B-Real line includes shampoo, conditioner, lotion and body wash.